The U.S. Department of Justice (DOJ) recently announced charges in the largest health care fraud scheme in history. According to a July 13 New York Times article, U.S. Charges 412, Including Doctors, in $1.3 Billion Health Fraud by Rebecca R. Ruiz, health care providers falsely billed insurance companies for tests and drugs never issued to patients. Also, the providers gave drug prescriptions in exchange for cash. According to the article, one drug treatment facility in Delray Beach, Florida, billed insurance companies for treatments such as urine testing in excess of more than $50 million. 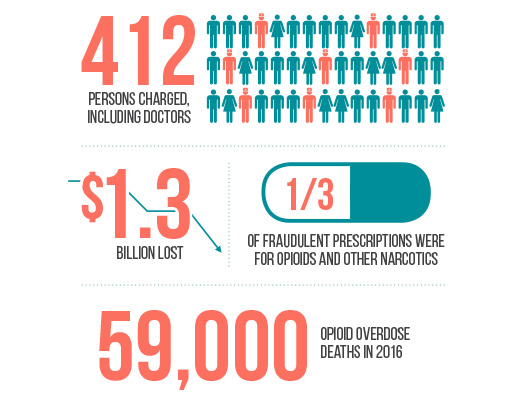 Of the 412 individuals charged with fraudulent activity, one-third of the prescriptions were for opioids and other narcotics. These controlled substances often end up on the streets adding to the drug abuse crisis. Acting administrator of the U.S. Drug Enforcement Administration, Chuck Rosenburg, claimed the opioid drug crisis to be “an epidemic,” which resulted in 59,000 overdose deaths last year. According to sources cited in the article, efforts of this major crackdown should have an impact on the war on drugs.